As Audiologists we are interested in how voices are transmitted. Back in the day before the telephone there were numerous individuals vying to be the first to transmit voice over a wire. Of course when asked “who invented the telephone”, the “pat answer” is and has always been Alexander Graham Bell. Its much like the answer to the question, “Who is buried in Grant’s Tomb”... of course the answer is President U.S. Grant. There are, however, forgotten questions surrounding patent #174465, which was eventually won by Alexander Graham Bell as the first person to transmit voice over a wire, thus inventing the telephone. Pizer (2011) suggests that it is a story involving an individual who has been called one of America’s scientific and inventive geniuses and has been held in the highest regard as the inventor of the telephone. The invention of the telephone, however, is shrouded in the claims of others that are said to have invented the device. 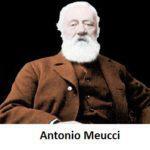 Was it Antonio Meucci, an Italian immigrant that began developing the design of a talking telegraph or telephone in 1849? Was it Elisha Gray that applied for the patent on the same day as Bell…or was it really Alexander Graham Bell? Careful scrutiny of hundreds of documents, including thousands of pages of sworn testimony before a Congressional Investigation Committee on the matter beginning in April of 1886, demonstrate that A. G. Bell was not necessarily the innocent, inquisitive and inventive deaf educator that just happened upon the telephone while working on a visible speech apparatus to assist his wife with her hearing. With much assistance from his father-in-law, Gardiner Greene Hubbard, it has been suggested that Bell was a party to what might be considered one of America’s most far-reaching historical deceptions. In the US Patent Office there is a now outdated term that is unfamiliar to most who are not used to patent terminology. In the 19th century when an individual was ready to file a patent but either could not afford to do so or the invention was is not quite ready, a one year renewable notice could be filed with the Patent Office. At the time this notice was called a Caveat. Caveats were introduced by the US Patent Act of 1836. The Act provided that: “any citizen of the U.S., or an alien who resided in the U.S. one year, and who has made oath of his/her intention to become a citizen of the U.S.; and who invented any new art, machine, or improvement can file a caveat in the US Patent Office making a request to protect the invention until the person has matured the invention.” A fee was also attached but the fee was much less than the fee paid for a patent application. Caveats were filed in the confidential archives of the US Patent Office, and preserved in secrecy. They were discontinued in 1909. There is discussion that Meucci had discovered the electromagnetic voice transmission technique long before Bell or Gray and had written a US Patent Office caveat long preceding any other claims. But the real controversy was relative to Gray’s Caveat. Some of the players in this drama were, of course, Alexander Graham Bell and Gardiner Greene Hubbard, but also Antonio Meucci, of Staten Island New York; Elisha Gray, an inventor from Illinois and the man that some feel was Bell’s “key to the city”. Also Zenas Fisk Wilbur, a patent examiner for telegraph related inventions and projects in the 1870s U.S. Patent Office, who tells one story in court and to congressional hearings, and a totally different one to clear his conscience on his death bed. Next week at Hearing International we shall tell the story of a web woven in congressional hearings, legal battles, bribery of public officials by old military buddies–all of which cloud the story of who is the REAL inventor of the telephone. As we shall see, the 1870s patent process, caveats, and officials may not have been very honest process during this time, especially for one as lucrative as the telephone. Pizer, R. (2011). The tangled web of patent #174465. Retrieved April 18, 2016. US Legal (2016). Patent Caveat law and definition. US Legal.com Retrieved April 20, 2016. ZoomInfo (2016). Zenas Fisk Wilbur. Retrieved April 18,2016. Famous scientists (2016). Antonio Meucci. Retrieved April 20, 2016. Grigonis, R. (2016). Gray versus Bell. Retrieved April 20, 2016. Smit, W. (2016). The invention of the Telephone: Graham Bell. My Home Page. Retrieved April 20, 2016. Spokeo (2016). Gardiner Greene Hubbard. Retrieved April 20, 2016. Rave (2016). AG Bell’s demonstration of the telephone. Retrieved April 20, 2016. The invention of the telephone seems to be a worldwide mess in terms of who first invented the device. There seems to be great financial disparity between who invented it and those that patented it. It’s an interesting story of those who had nothing, coming up with a revolutionary idea and ensuring that it worked, but being first or second or even third in line to invent it, was not enough to secure rights to the concept. The concept was presented as early as 1854 by Charles Bourseul, a civil engineer and mechanic for the French Telegraph company. Bourseul’s thoughts on voice transmission over a wire were as follows: “Suppose that a man speaks near a movable disc sufficiently flexible to lose none of the vibrations of the voice; that this disc alternately makes and breaks the currents from a battery: you may have at a distance another disc which will simultaneously execute the same vibrations“. It seems that Bourseul’s thoughts were seminal to the experiments of the time. Further investigation into the invention of the telephone, the transmission of voice over a telegraph wire, leads us to other European players that began theoretical consideration of devices that resembled the telephone as early as the 1840s with working models that were scientific novelties in the 1860s. The first of these was an Italian, Innocenzo Manzetti (1826-1877). 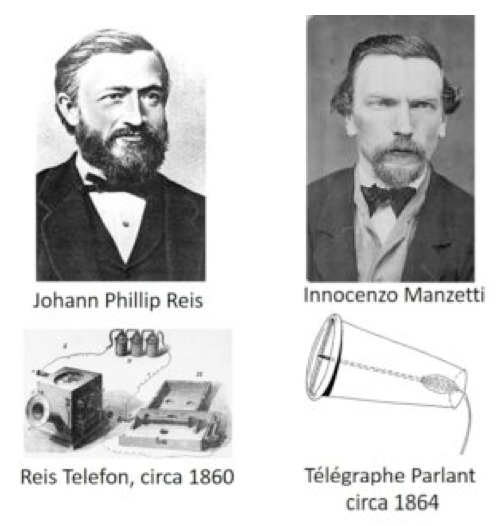 To some Manzetti is the real inventor of the telephone and to others it’s Johann Phillip Reis (1834-1874), a German. Manzetti composed a make and break transmitter and a magnetostriction receiver that was similar to the device invented and researched by Phillip Reis. Manzetti and Reis did not know each other; they worked independently and neither inventor was showered with accolades for their inventions until much later. Reis was even told by the Free German Society of Frankfurt that his telefon was a “philosophical toy”. Both devices were probably the first to transmit speech over a wire and were demonstrated to royalty and scientific societies in Europe. Reis was rather sickly and both inventors were quite poor and did not have the resources to obtain patents or move their inventions on to a commercial success. Antonio Meucci (1808-1889) was an Italian immigrant born in the area of Tuscany who began his adult life as a Florentine artist and stage hand. In the 1830s he moved to Cuba and while working on methods to treat illnesses with electric shocks, he found that sounds could travel by electrical impulses through copper wire. With knowledge of Bourseul’s comments and sensing potential, Meucci moved to Staten Island in 1850 to develop the technology. Several notes by Meucci, purportedly written in 1857, describe basic principles for electromagnetic transmission of sound and voice, arguably put him as the first to invent the telephone. When Meucci’s wife Ester became paralyzed, he set up a series of components that linked her bedroom with his neighboring workshop and, in 1860, held a public demonstration which was reported in New York’s Italian-language press. Due to his wife’s condition and some financial setbacks, Meucci could not afford the $250 needed for a definitive patent of his “talking telegraph”. So in 1871, three years prior to Bell or Gray, Meucci filed a one-year renewable notice of an impending patent, or a caveat. Three years later, however, he could not afford the $10 to renew it and, thus, the idea “went up for grabs” to anyone who could afford the filing fees for a similar invention. He sent a model and technical details to the Western Union telegraph company but for some reason failed to win a meeting with executives. When he asked for his materials to be returned, in 1874, he was told by the Patent Office that they had been lost. 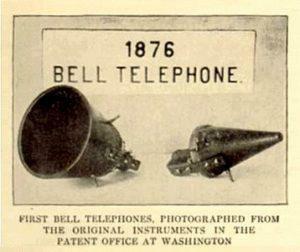 Two years later, Bell–who shared a laboratory with Meucci–filed a patent for a telephone. Alexander Graham Bell (1847-1922) was born in Edinburgh, Scotland and educated there and at the University of London. He also studied under his grandfather, Alexander Bell, a noted speech teacher. Bell’s father was also a speech teacher and noted phonetician. Bell taught elocution at a school for the deaf in London using his father’s methods. In 1870, Bell immigrated with his parents to Canada. Two years later he established a school for the deaf in Boston, Massachusetts, and the following year became a professor in speech and vocal physiology at Boston University. While teaching, he experimented with a means of transmitting several telegraph messages simultaneously over a single wire and also with various devices, such as the visible speech apparatus to help the deaf learn to speak, including a means of graphically recording sound waves. Bell was a visitor to the laboratory of Manzetti and much of the Reis research was known to him as he worked to develop his device before the others that working to develop the telephone. Had patents been recorded on February 14, 1874 with the usual and customary processing schedule, more of us would know Elisha Gray (1835-1901). Born in Barnesville, Ohio, Gray worked as an apprentice to a blacksmith before attending Oberlin College, just outside of Cleveland, Ohio. Gray was always interested in the way in which mechanical objects functioned and began to make a name for himself as an inventor. He invented the first music synthesizer called the “musical telegraph” and the device is sometimes credited as being the first electronic musical instrument. As an American electrical engineer, Gray co-founded the Western Electric Manufacturing Company and is best known for his development of a telephone prototype in 1876 in Highland Park, Illinois and for contesting Alexander Graham Bell’s actual invention of the telephone. In his time, Gray was a well known inventor and went on to invent other interesting concepts and machines such as the telautograph in 1887, forerunner of the fax machine. Since the device could remotely transmit handwriting through the telegraph it was used by banks for signing documents at a distance and by the military for sending written commands during gun tests when the deafening noise from the guns made spoken orders on the telephone impractical. The machines were also used at train stations for schedule changes. Gray was granted several patents for these pioneer fax machines, and the Gray National Telautograph Company was chartered in 1888 and continued in business as The Telautograph Corporation for many years; after a series of mergers it was finally absorbed by Xerox in the 1990s. Gray displayed his telautograph invention in 1893 at the 1893 Columbian Exposition where he was also chairman of the International Congress of Electricians at the World’s Columbian Exposition of 1893. A talented professor and brilliant inventor died in 1901 in Newtonville, Massachusetts. Mr. Wilber, a distant relative of US President Rutherford B. Hayes, was appointed to the US Patent Office in 1870 and became the patent examiner for telegraph related patents. Wilber was a major player in this saga as he was the one that approved patents and recorded when these patents were granted. Zenas Fisk Wilber fought in the civil war as an Army Major with Bell’s attorney, Marcellus Bailey. Wilber was, however, an alcoholic and owed Bailey money (a serious Patent Office ethics violation). For a $100 bribe (about $2,100 in today’s money) Wilbur showed his ex-Army buddy Gray’s caveat application which described how to send a voice over a wire. Bailey was startled to find that it wasn’t a patent on a harmonic telegraph–the device Bell was submitting. 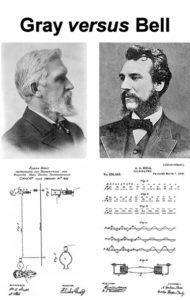 Rather, Gray’s was a patent for a telephone, capable of transmitting all the sounds of human speech and music. Bailey summoned Bell to come to DC at once where he (Bell) made modifications to his patent that virtually copyed Gray’s design. Wilber’s serious departure from normal ethical standards in the US Patent Office was a grave error that affected the timing of the recording of Bell’s patent relative to Gray’s caveat and led to one of the most controversial patent wars in history. Next week in the conclusion of this story, we will put these US players in perspective and discuss the controversy over the most lucrative patent in US history. Carroll, R. (2002). Bell did not invent the telephone, US Rules. The Guardian. Retrieved April 20, 2016. History.com (2016). Alexander Graham Bell. Retrieved April 19, 2016. Library of Congress (2015). Who is credited with the invention of the telephone. EverydayMysteries.com Retrieved April 19, 2016. Grigonis, R. (2011). Who Really Invented the Telephone? Part 1 — Johann Philipp Reis (1834–1874) Retrieved April 25, 2016. Grigonis, R. (2011). Who Really Invented the Telephone? Part 2 — Innocenzo Vanzetti (1826-1877). Retrieved April 25, 2016. Flickr (2016). US Patent Office. Retrieved April 26, 2016. Wikipedia (2016). Charles Boursel. Retrieved April 26, 2016. We have seen that the invention of the telephone was not necessarily the brainchild of Alexander Graham Bell, and have found that there were a number of European and American inventors involved in its development but many either did not have the funds to obtain a patent or were simply interested in the scientific merit of their project. Some of the inventors were known to each other and others were not; some even shared the same laboratories and stole information from each other. While there were others that vied to obtain a patent for similar devices, we now know that there was another significant person involved, Elisha Gray, who challenged Bell for the lucrative honor of inventing the telephone. Bell’s patent will be one of the most contested patents in history but eventually he will stand in US courts and Congressional investigations as the individual that invented the telephone. But was AG Bell really first? Was his design the best? That is our Hearing International story this week. As mentioned in Part II, a caveat was akin to a provisional patent application with drawings and description but without a request for examination. It was a type of preliminary application for a patent that gave an inventor an additional ninety-day grace period to file a regular patent application. The caveat would prevent anyone else that filed an application on the same or similar invention from having their application processed for ninety days, giving the caveat holder an opportunity to file a full patent application first. A caveat was an inexpensive method of reserving the precedent of an idea or invention at a very reduced cost and was allowed by US Patent Law from 1839-1909. The Meucci issue of not having enough funds to renew his caveat for the real invention of the telephone notwithstanding, it seems that the key day for who ultimately obtained the US patent for the telephone was February 14, 1876. St. Valentines Day began in Washington D.C. as a patents and a caveat show at the US Patent Office on G Street. On that day in the US Patent Office there was a certain procedure for handling the documents that was always the same. According to Evenson (2000), the clerk’s procedure never varied: all of the documents received by mail in the morning and afternoon were recorded first, followed at the end of the day by the hand delivered ones, which were taken from the in-baskets. It seems that Elisha Gary’s Caveat, titled “Instruments for transmitting and receiving vocal sounds telegraphically” and Bell’s patent application were hand-delivered before noon. While Gray’s caveat was simply deposited to the in-basket forprocessing later in the afternoon, the person hand-delivering Bell’s patent application (Bell was in Boston at the time) demanded that the paperwork immediately be given to the Telegraphic Patent Examiner Zenas Fisk Wilber in Room 118. On the way to Rm 118, the Chief Clerk recorded Bell’s application as the fifth one received that day, while Gray’s caveat was entered a couple of hours later through the normal, slower process and became the 39th application processed from the in-basket. Gray’s application in the in-basket would have been recorded ahead of Bell’s, if not for the extraordinary processing received by the latter. This leads to the popular myth, encouraged by Bell’s father-in-law Gardiner Hubbard and his other attorneys, that Bell’s patent application was filed “two hours” before Gray’s caveat (in some versions of the story, it’s four hours). During the following week, Patent Examiner Zenas Fisk Wilber examined both sets of paperwork (Bell’s and Gray’s). He saw that the claims in Bell’s application might interfere with Gray’s caveat and, in accordance with standard procedure, sent a letter to Bell and his attorneys, suspending Bell’s patent for 90 days. Gray should then have had 90 days to file a full patent application and, upon submission, the patent examiner, Zenas Wilber would determine if a real interference condition existed. After the suspension, Bell came to see Wilbur in his office where he was shown the Gray caveat. It has been suggested that Bell amended his patent at this point to reflect some of the principles that were part of Gray’s design. At the end of this visit, Wilber, a known alcoholic and said to be “under the influence” at the time, accepted Bell’s $100 bribe. According to Wilber’s confessional affidavit in 1886, he also freely admitted that his wartime relationship with Marcellus Bailey, one of Bell’s attorneys, also influenced him toward the Bell patent. Of course, Mr. Bell’s response to this affidavit was, “There is not a shred of truth in the story”. Yes, Gray’s Caveat was first! While Bell’s court battles against Gray and others have always held up in court, without the expedited processing, the patent amendment, the $100 bribe and the wartime relationship with Marcellus Bailey, it seems probable that Elisha Gray would have been the official inventor of the telephone. Thus, the Graying of Bell’s Telephone Patent! Evenson, E. (2000). 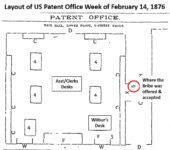 The telephone patent conspiracy of 1876. Jefferson, North Carolina: McFarland & Company. Retrieved May2, 2016. Grigonis, R. (2016). 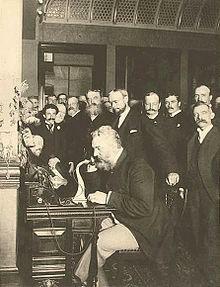 Who really invented the telephone, part III: Elisha Gray (1835-1901). Zippy’s blog. Retrieved May 3, 2016. Nicius (2016). US Patent Office 1880. Retrieved May 3, 2016. Wikipedia Commons (2016). Mr. Wilbur Confesses: Ex-patent examiner says he was bribed. Affidavit of Zenas F. Wilbur, April 8, 1886. Retrieved May 3, 2016. Robert M. Traynor, EdD, MBA is the CEO and audiologist at Audiology Associates of Greeley, Inc., Greeley, Colorado. Dr. Traynor holds degrees from the University of Northern Colorado (BA, 1972, MA 1973, EdD, 1975) and the University of Phoenix (MBA, 2006). He did post doctoral study at Northwestern University (1984). He is a Fellow of the American Academy of Audiology, is a Board Certified Doctor of Audiology. Currently he serves as a member of the Board of Governors for the American Board of Audiology, the agency that issues Audiology Certification. Additionally, he is a life member of the American Speech Language Hearing Association and held their Certificate of Clinical Competence in Audiology since 1974. He taught audiology at the University of Northern Colorado (1973-1982), University of Arkansas for Medical Sciences (1976-77) and directed the audiology program at Colorado State University (1982-1993). He is currently an adjunct professor in the Doctor of Audiology (AuD) programs at the University of Northern Colorado, University of Colorado-Boulder, and the University of Florida. A retired Lieutenant Colonel in the U.S. Army Reserve Medical Service Corps, Dr. Traynor has lectured in 40 countries around the world on most audiology topics. For 17 years, he was the senior international audiology consultant to a top hearing instrument manufacturer. He served on hearing aid research and development committees, traveling the world to provide academic audiological and product orientation services to distributors their staff and audiologists. Dr. Traynor is co-author of the audiological text, Strategic Practice Management, now in its 2nd edition, used in most university audiology programs.